Uglyworld #720 - Turtle at Mount Adams, originally uploaded by www.bazpics.com. The "main event" of yesterdays daytrip was detailed by Turtle as "Awesome views of Mount Adams", and sure enough the little guy delivered once again with his meticulous planning skills. Not only were we able to see the mountain up close from several places, but Turtle even planned the routes to and from the mountain so that we could still see Adams peak from miles away. 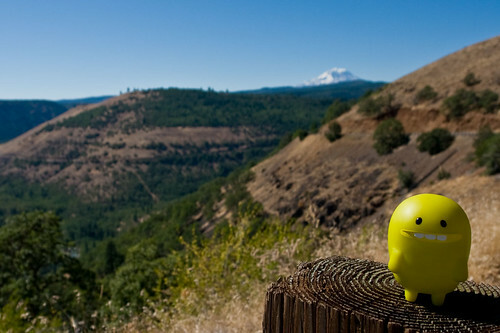 This shot was taken on the hillside overlooking the Klickitat River on the Yakima Indian Reserve, and you can clearly see what I mean about Turtle's planning skills with Mount Adams sitting proudly above the other hills and peaks in the distance. This shot was specifically taken for a future installment of Turtle Time magazine.